I thought it looked like the Bird of Paradise flower worrrr…. Joyce says: It does? Hmmm…funnily enough I don’t see it. Looks like a running lady with wings. Joyce says: That’s what I thought. no need to see la..just frame it up. Joyce says: Eeek. We didn’t take it back….now I only get to frame the digital copy. i also feel like it is a bird..
Joyce says: Really? What kind of bird? Joyce says: Wow. You have a very vivid imagination! it is indeed an art!! 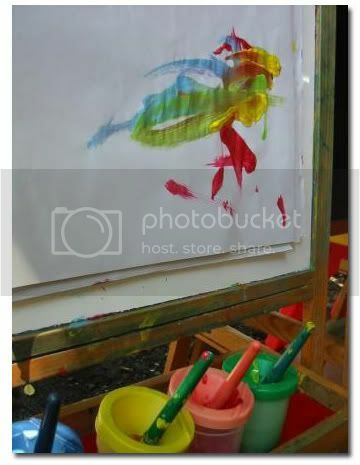 i saw an animal,bird or flamingo..
Joyce says: The easel is provided by The Learning Center, but I do know that you can buy good easels from Ikea. for me.. look like any colourful bird …..
it’s can be an abstract painting la .. only the “artist” know what he is drawing … hehehe by inspirartion !!!! Joyce says: I wonder what he could be inspired by…hmmm..